In 2014, BMW made something rather unusual for a car company. It designed a two-man bobsled for the U.S. Olympic team to use in the Sochi games. For this year's Paralympics in Rio de Janeiro, Brazil, the company has used its race car expertise to design a new racing wheelchair. It's only making six to start, one for each member of the U.S. team. 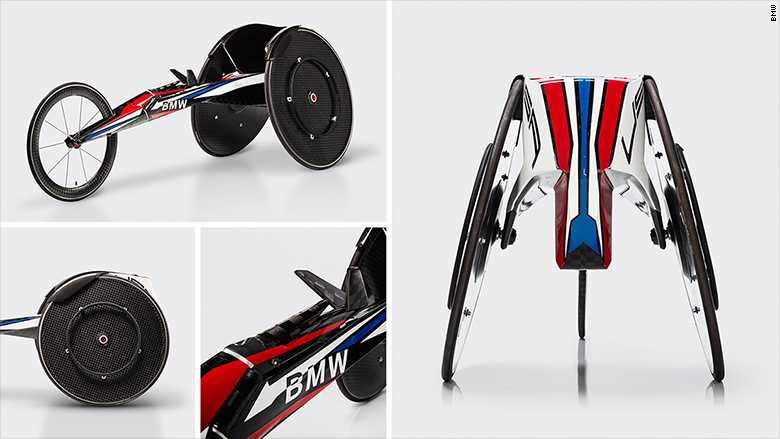 Long, sleek and low with three narrow wheels, the BMW wheelchair doesn't resemble a traditional wheelchair. Made out of carbon fiber and whittled down to only the most essential parts, it's designed to be an aerodynamic extension of the athlete's body. Paralympic gold medalist and six time world champion wheelchair racer Josh George is one of a handful of people who has tested the chairs. He started racing when he was nine years old, after being injured in an accident when he was four. At Rio, his fourth Paralympics, George will compete in the 400, 800, 1500, and 5000 meter races, as well as a marathon. He's worked closely with the BMW team to make sure the final chair is just right for racing. The process is not as simple as making a wheelchair go faster. "You're basically turning us into cyborgs, part machine and part human, and you have to be able to interact with that machine seamlessly to get the most out of it," said George. BMW's Design Works lab started working on the wheelchair a year and a half ago. The team was entirely unfamiliar with wheelchair racing, something George saw as an advantage, since they had no preconceived notions about what a racing wheelchair had to look like. They focused on improving three things: aerodynamics, the stiffness of the chassis, and how it fit the athlete's body. They used computer simulations to design the most aerodynamic shape possible. Unlike traditional welded aluminum chairs, BMW made theirs out of carbon fiber, which allowed them to create any shape they wanted. The final touch was customizing each chair. Using a combination of 3D scans and body measurements, each chair is molded to fit an athlete's body exactly so that there is minimal shaking or movement during a race. Wheelchair racers typically create their own custom gloves from hobby putty, so BMW borrowed their favorite gloves and 3D scanned them so they could print out a new, more durable and lightweight pair on demand. "These athletes deserve all the credit, they're the ones that win the race," said Brad Cracchiola, the associate director at BMW Design Works. The final chairs aren't finished yet, but BMW says they'll be ready before the Paralympic games start on September 7. Wheelchair racing is a young sport that began after World War II left a record number of young men with limited mobility. Used to leading active lives, many veterans looked at their chairs and took the next logical leap. "You see something with wheels on it, you want to see how fast that thing can go," said George. The first wheelchair racers just modified existing wheelchairs in their garages, hacking off pieces to make them lighter and faster. In the 1980s, companies began designing custom wheelchairs for competitions, borrowing inspiration and equipment from the cycling world. Now a number of companies design wheelchairs just for racing, including Honda in Japan. For racers like George, the increase in professional chair options shows that the sport is gaining in popularity. "The idea of a pro wheelchair racer is growing, and it's going beyond just this therapeutic medical model of 'isn't it nice for people with disabilities to get out of the house and do things,'" said George. "It really shines a light on the fact that we are athletes first, we're not wheelchair users."